Oh Nigella Lawson, my culinary idol and inspiration. This iconic domestic goddess just influences everything I do in the kitchen. If you didn’t know, Nigella is basically the whole reason why I even got into cooking. Thank God for that one day when I skipped school, stayed home, turned on the TV and saw my very first episode of Nigella Bites back when I was in Grade 12. The way she speaks, the way she moves in the kitchen, and her whole philosophy on food and life is everything I live for. I’ve actually talked about Nigella at every single one of my job interviews within the last 5 years. I’ve gotten hired every single time. Whenever I get an idea of a dish to make, the first thing I think to myself is – “Now what would Nigella do? What has she made that’s similar?” and I might go and flip through her whole repertoire of cook books to further develop my idea. I’ve actually got a copy of Nigellissima and Nigella Christmas sitting at my feet right now, and I can basically feel her presence seeping through my soul…. or maybe that’s just the wine I feel. 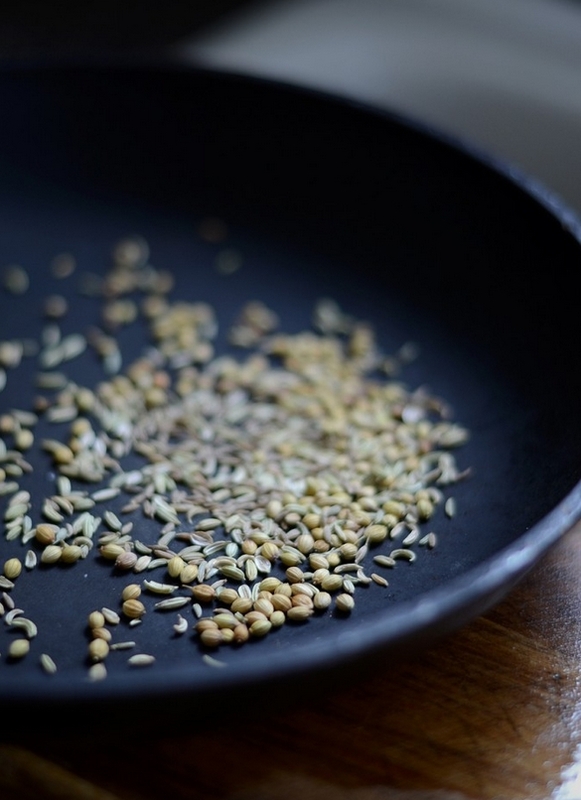 I tried cumin for the first time after watching an episode of Nigella Feast (or was it Bites…), when Nigella was making some roasted chicken coated with cumin, cinnamon, and coriander and said it was like “a taste of the Kasbah” and I fell in love. Actually, I’ve probably used that phrase at least 5-6 times in my posts over the last year and a half. Oh, that and “like the ruby red jewels of the middle east” when describing pomegranates, which I’m also obsessed with thanks to the domestic goddess. 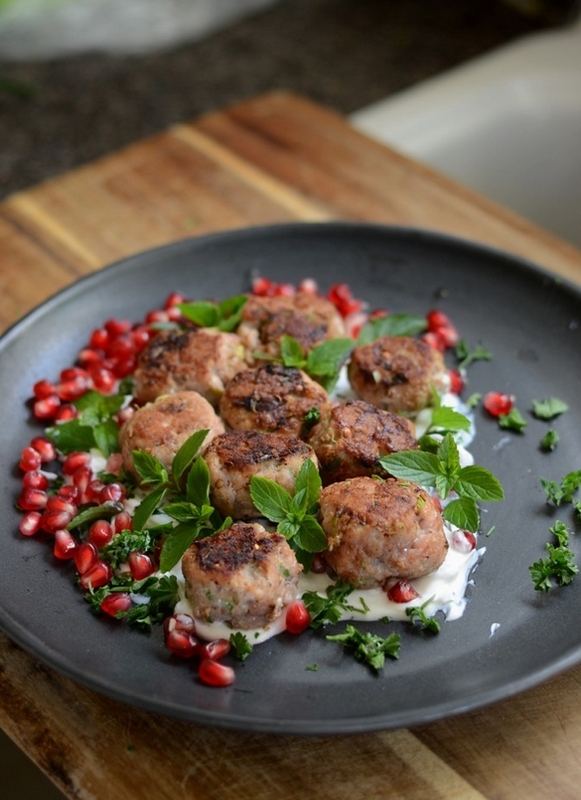 Anyways, I felt all middle eastern-esque this morning and decided I wanted to do some lamb meatballs with a yogurt sauce. However, I also remembered that it’s almost Thanksgiving in the US so I thought “What the hell, lets do some turkey meatballs!” and they were fantaaaaastic. The complex blend of fennel, cumin, and coriander, paired with the cooling breath of a pomegranate and mint yogurt sauce? Divine. I’m actually so surprised my mint is still flowering and growing strong in my garden. You go mint, you go! 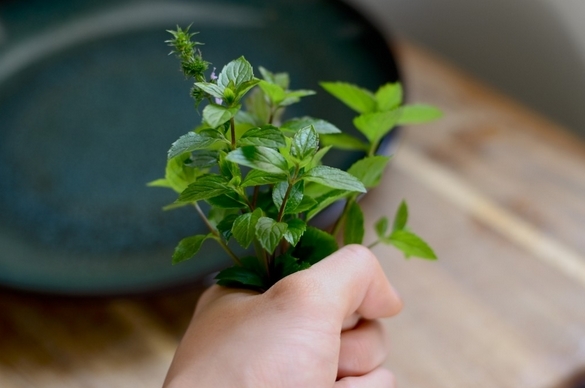 Please stay as long as you would like, because it is easily one of my favourite herbs! Also, I’ve been putting pomegranates in everything I’ve been making, but I just can’t help it if they’re SO good and in season right?! Plus, they’re just the prettiest things on earth. Now this recipe will basically work with turkey, chicken, lamb, what have you. However, I do think that lamb or turkey would be the yummiest. Why? I don’t know. I’m slightly drunk right now, and whatever I say goes ok? 2. Finely chop up your spring onions, and combine with the ground spices, meat, a pinch of salt and pepper along with a good drizzle of olive oil. If you’re using turkey, add a bit more olive oil as it is SUPER lean and needs some fat. Yay fat! 3. Roll into small balls, you should get around 20. 4. Heat up a pan, slick with some oil, and cook for 4-5 minutes on each side for the turkey ones until they’re fully cooked. You can get away with them being a little underdone if you’re using lamb. 5. Combine the greek yogurt, a bit of salt and pepper, 1/4 cup of pomegranate seeds, and a little bit of the chopped parsley for the sauce. 6. 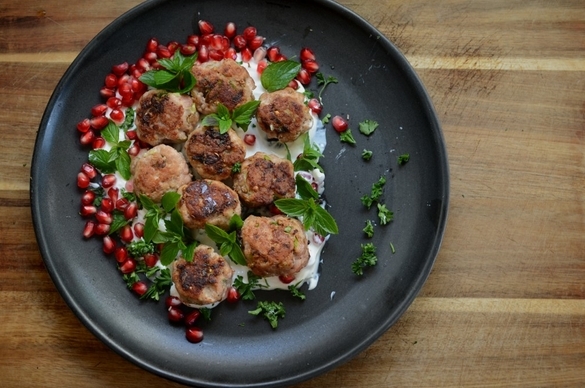 Place meatballs on top of the yogurt sauce, and top with the remainder of the pomegranate seeds, parsley, and mint leaves! Serve with a salad, jewelled couscous, whatever fits your fancy! Deeelicious. 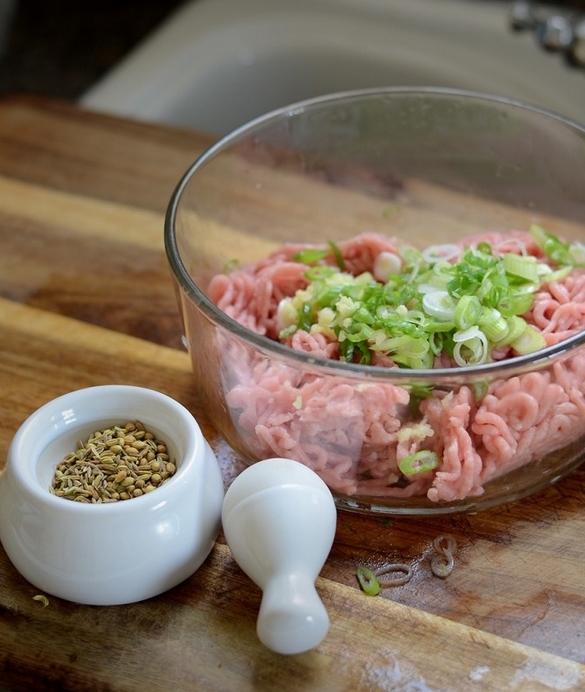 Give it a try, let me know how you like it, and share the recipe!